These nights, the snow that has taken Geneva by storm glistens magically beneath the local “Festival of Trees and Lights”. Unsettling Christmas baubles dangle from a barren tree at the Square des Alpes – the large spheres look as if radiant red lava is bursting apart their black surfaces. Nearby, at the Rotonde de Mont-Blanc, the flattened tips of conical yew trees have been adorned with one light each: sometimes these lights flicker devlishly red, transforming the trees into huge candles. At other times the lights suddenly start rotating, emitting a heavenly white cone that converts the trees into miniature light-houses. All across Geneva, colorful lights are intertwined with trees. The fact that Pac-Man is depicted in a high-brow art-installation organized by the City of Geneva and funded by banks and other conservative companies shows how deeply the two formerly niche cultures of video games and street art have penetrated high society. As a matter of fact, the off-screen, real-life depiction of low-resolution, large-pixel video-game characters was pioneered by the French Street Artist “Invader”, who in the movie “Bomb-It” laconically remarks “The name of the game is Space Invaders, and I”m invading space – public space. It was very logical.” According to his , quite a few of his colorful mosaic tiles portraying space invader figures are stuck on walls and other objects in the immediate vicinity of the glowing Pac-Man figures in Geneva. Also non-Street Artists have paid tribute to the irresistable charme of lovable 1980s polygonal video-game shapes, as can be seen in this human interpretation of Tetris created in Lausanne, not far away from Geneva. What sets apart the Pac Man installation from preceding artistic video game renditions is that it stops a game midway – and thereby highlights what contemporary street art does not portray: motion. Invader glues one lone Space-Invader-figure to each public space, thus his artworks are completely taken out of the context of game play – they do not need motion to have an effect. Guillaume Reymond uses an elaborate stop-motion video-filming technique in order to re-introduce motion into his statically sitting actors. 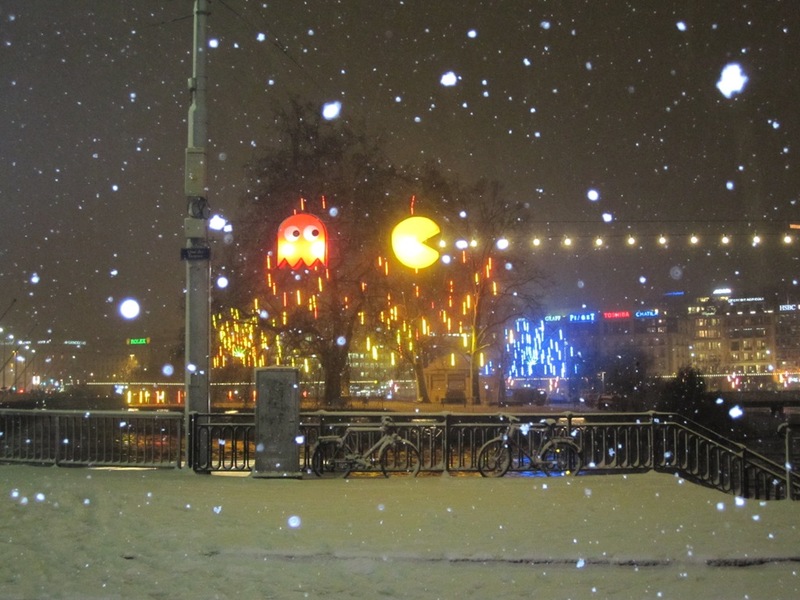 Yet Geneva”s Pac-Man, Inky, Blinky, Pinky, and Clyde are all frozen forever atop the surreal winter landscape consisting of snow, lights and lake – poor Pac-Man cannot even reach the closest light-bulb, no matter how tastily it shines at him. It”s not even worthwhile to shout “Run, Pac-Man, Run”, since Blinky will never get him either. Geneva”s lighted Pac-Man figures may have been freed from the rough edges of their pixels, yet now they are begging to be set free to dash along their Harrods light-bulb-string. And thereby, they raise the question: What would it be like, if real-life Street Art could move freely across real-life streets, the way that virtual video game figures move across their virtual landscapes? The future of street art will belong to geeks who are able to hack into the advertising loops programmed to run simultaneously on millions of outdoor LCDs throughout the world in order to insert there own “easter egg” – street art that in fact will move from display to display, cheering up the passer-bys on its route.